Technique: Body mold-blown in a full-size and conical mold. Neck and mouth free blown. Handle applied, tooled. 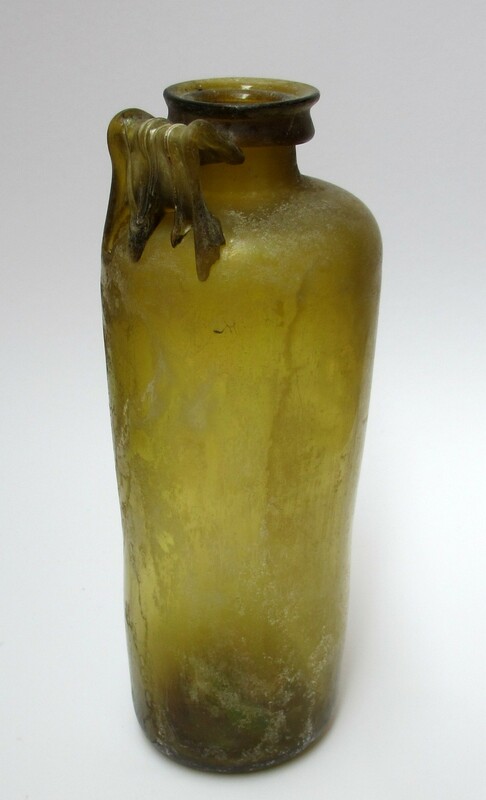 Description: Transparent yellowish brown glass. Cylindrical body and short cylindrical neck; rim folded outward, down, upward, and outward to form a collar with a horizontal ledge. Shoulder slopes, with rounded edge; wall tapers slightly and curves in at bottom; base plain, slightly concave on underside; no pontil. Strap handle with four ribs, applied onto edge, drawn up and in, and attached immediately below rim, with excess glass pulled down neck. 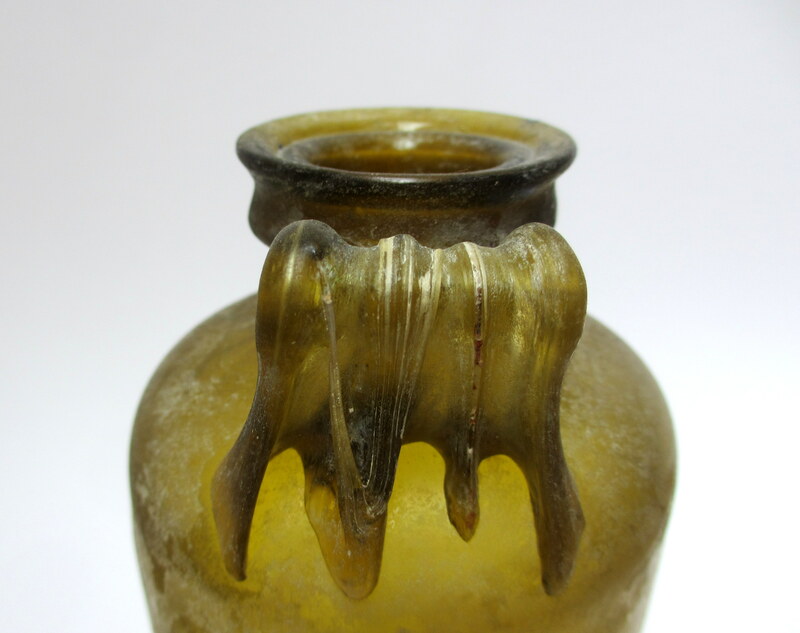 Remarks: The glass blower has used a smooth-walled mold, which facilitated mass production. The collar rim with a ledge is an eastern Mediterranean feature, although it is not common in Palestine, Syria or Egypt. 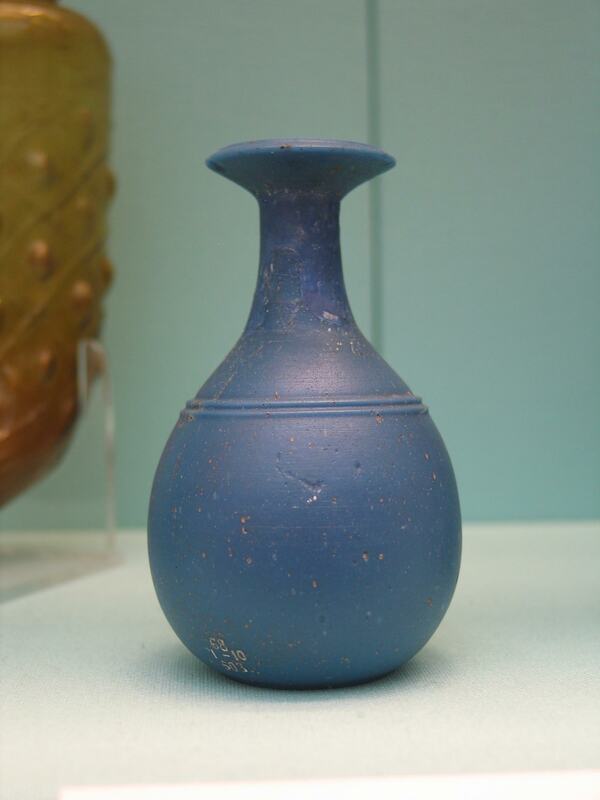 Finds appear to be concentrated farther north, in Cyprus, Asia Minor, Greece and on the coasts of the Black Sea. Cylindrical bottles with a collar rim have an even wider distribution including North Africa. 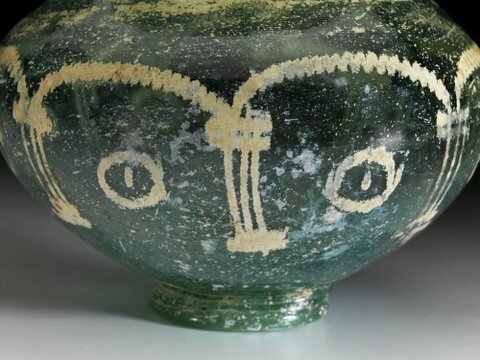 The outline of the rim has parallels in pottery and metal vessels from Pergamon, a circumstance that has led to the hypothesis that the collar rim might be a Pergamene speciality and that the workshop or workshops producing this type of rim may have been located in that area. 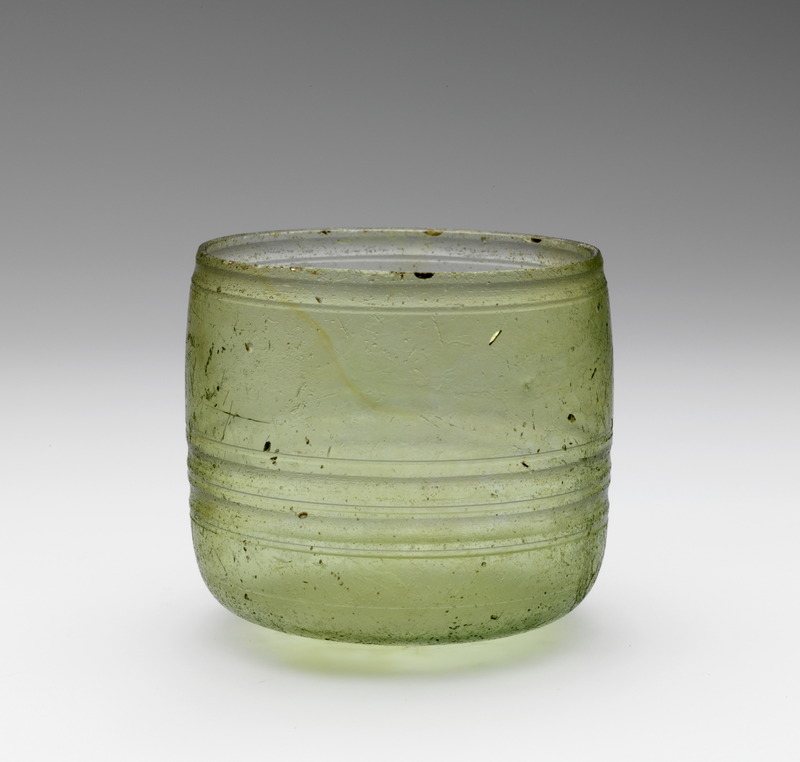 Date: – early Roman Period, end of the 3rd century BC- 1st century AD. Description: Almost circular mosaic bead of moss green glass exhibits a central rosette of white glass embedded in a field of black glass, encircled with a line of white glass and surrounded by fifteen oval spots of white glass. The surfaces are glossy, suggesting that they were polished. Perforated to be strung. In a very good condition. 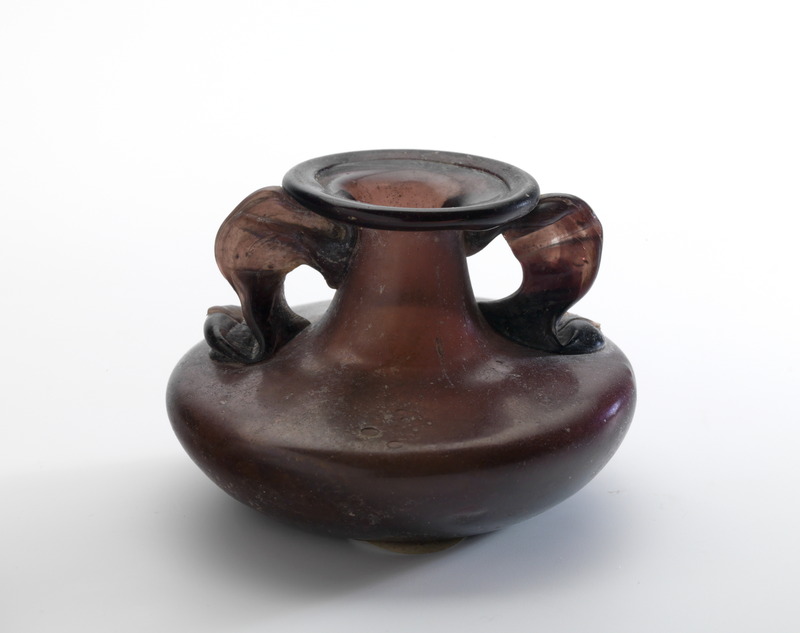 Description: A Judaean glass pendant of dark amber brown to black colored glass with a Menorah (seven-branched candlestick) on a tripod base(?) The pendant with a large suspension loop. Nearly all documented glass medallions are decorated with a menorah flanked by at least two ritual objects, most often the lulav and the shofar, sometimes the etrog. These Jewish symbols express the messianic hopes for the rebuilding of the Temple in Jerusalem and the freedom of Israel. 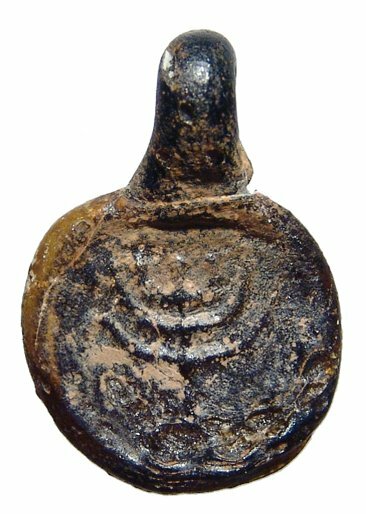 However, among the pendants decorated with just a simple menorah, an example now housed in the Israel Museum (inv. 77.40.1017) features a candelabrum very similar to ours (Hachlili 2001, IS 16.16., p. 344, pl. II.73). 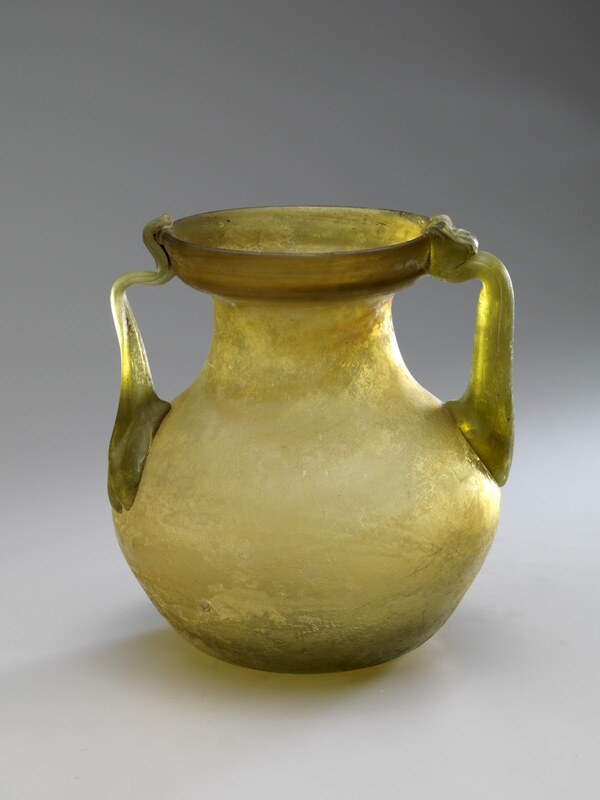 Remarks: This artifact is one of a large number of glass pendants produced in the Holy Land and intended both for the natives and for the pilgrims. The vast majority of these pendants were found on site, but only a few come from precise archaeological contexts. The examples discovered at Jalame, Tzippori and Tarshiha suggest a date ranging from the early 5th to the 6th century A.D. for this class of medallions (Hachlili 2001, pp. 108-109, and pp. 342-345 for an inventory of the identified pieces). There are no identical specimens. Reference: Israeli, Y., Israel Museum, 2003, p. 316, fig. 430, Spaer, M., Israel Museum, 2001, p. 362, figs. Date & Origin: 4th century AD. Eastern Mediterranean. Size:H= 11.5 cm. D max= 11.8 cm. D rim= 9.5 cm. D base= 4.3 cm. Weight 224 gr. Classification: Isings 1957: Form 94. Condition: Intact. Crack across base. Iridescence and weathering, especially in abraded area. Technique Free blown. Wheel-abraded. Foot applied. 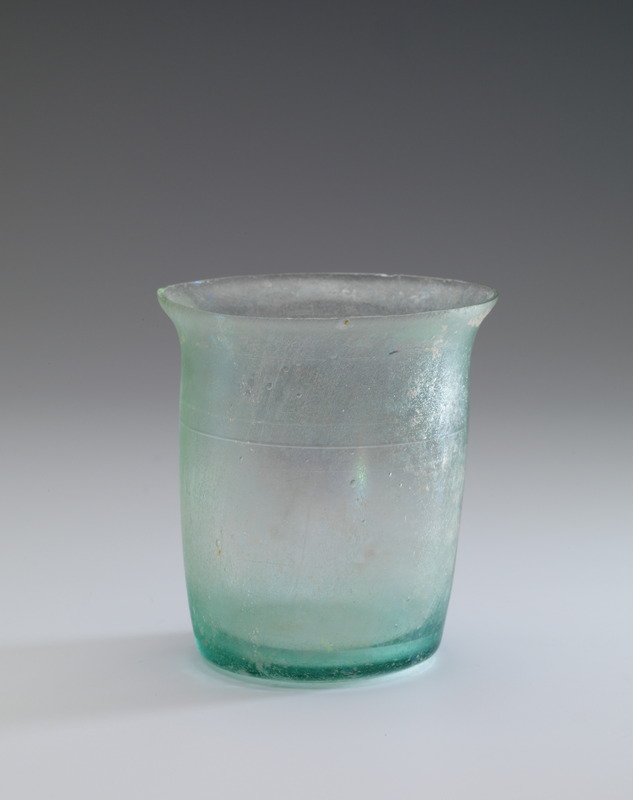 Description: Transparent pale greenish-blue glass. Jar with squat globular body on applied coil-foot. Short flaring neck to mouth with thickened rim, rounded in flame. Below the rim a thick applied coil wound around neck. Body decorated with wheel-abraded arcades, consisting of eight fluted pillars, each on a broad base and topped by broad capitals, connected by close zigzag arches. Abraded circles with central dot between the pillars. 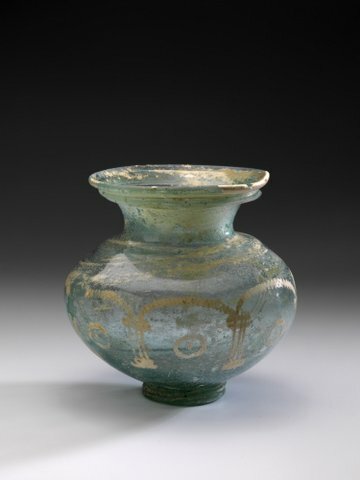 Remarks: This bulbous jar is reminiscent of Isings form 94, which she dates to the 2nd century AD, but the rare wheel abraded decoration is more common on 4th century AD glasses like the engraved jar in the Royal Ontario museum, Hayes 1975, No. 590. The decoration however, may also have been applied in the 4th century on a jar from the 2nd century. 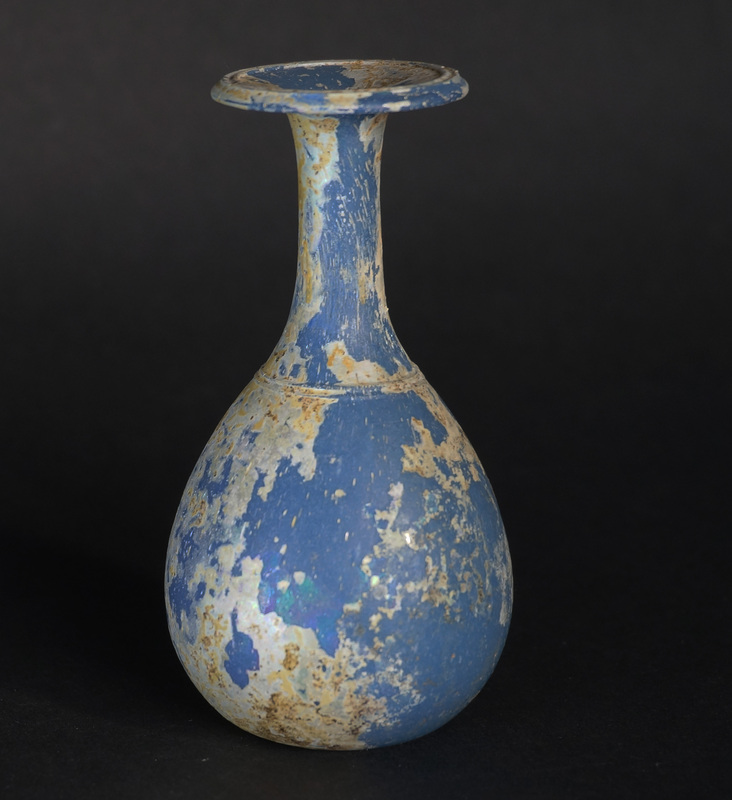 It has been suggested that the abraded decoration had been filled with white paint. XRF-analyses has proven that the white of the arcades is pure (iridescent) glass and not paint. Published: Antiek Glas 2001, video film Allard Pierson Museum. , Beek 2001, Antiek Glas, de kunst van het vuur, No. 13. ,Christies 3 July 1996, No. 316. ,Sheppard & Cooper Ltd, 1994, No. 53. Exhibited: Allard Pierson Museum, Amsterdam, Antiek Glas, de kunst van het vuur, 17 May – 16 September 2001, No. 131. , Thermenmuseum Heerlen (NL), Romeins Glas, geleend uit particulier bezit, 29 April – 28 August 2011, No. 239. References: Hayes 1975, Ontario Museum, No. 590, Sotheby’s London 4/5 June 1979, The Constable Maxwell Collection, No. 266, (for the decoration). Description: Transparent manganese glass, squat globular body with broad and almost flat shoulders. Short wide cylindrical neck tapering towards rim. Outward-flared rim with inward folded lip. Two dolphin-shaped handles drawn from under the rim towards the shoulder, squeezed to form narrow, vertical and circular handles. Concave base with pontil mark. Remarks: This type of aryballos was common in the western part of the empire. 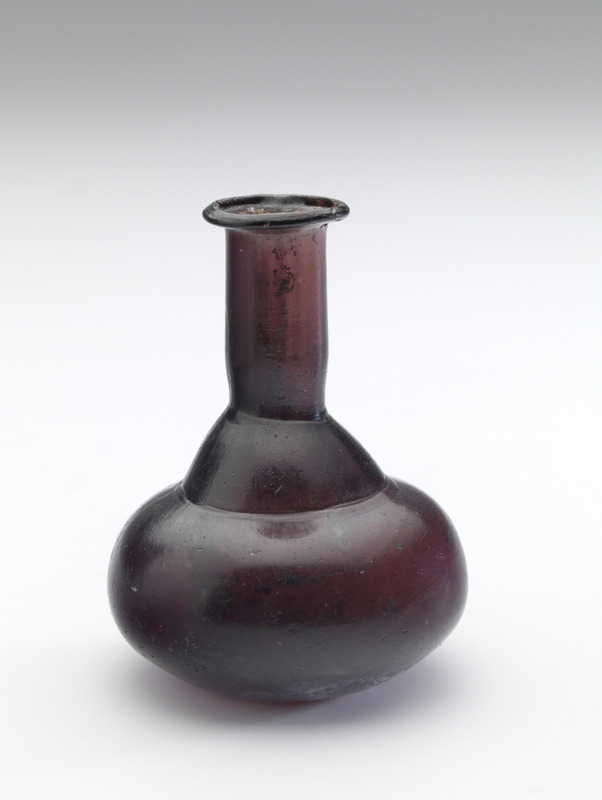 The dolphin- shaped handles are characteristic for the Rhineland area but manganese glass was not made in Rhineland, most probably due to lack of the raw material which was necessary to make this color. The way in which the dolphin-shaped handles are squeezed refers to the specific ‘Dolphin-flasks’, see: Die farblosen Gläser der Frühzeit in Köln, F. Fremersdorf & E., Polónyi-Fremersdorf nos. 202 – 209.